Indium Corporation will feature its new technology platform using the SACm™ Solder Alloy at Productronica November 12-15 in Münich, Germany. SACm™ is a high-reliability solder alloy that increases the drop-shock performance in portable electronics by 800%, without compromising on thermal cycling. SACm is doped with manganese and contains less silver than other Pb-free alloys. The manganese provides increased strength, and the reduced silver content provides a more stable cost structure, especially beneficial for cost-sensitive applications. 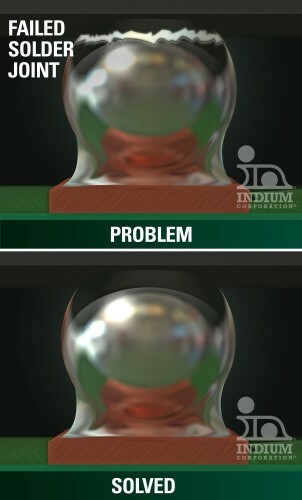 The platform consists of Indium8.9 Series solder pastes using Indium Corporation’s patent-pending SACm™ solder alloy technology for board-side interconnect, and SACm™ solder balls (spheres) for package-level interconnect. Indium Corporation will be exhibiting at stand A4-402.